In a one gallon re-sealable plastic bag, combine all ingredients. Salt and pepper to taste. Add 4 chicken breasts, seal. Toss to coat. Place bag and contents in a bowl. Refrigerate 6 to 12 hours, turning often. Remove chicken from the marinade. Discard marinade. Grill, fry, or bake until cooked through. I love to use a marinade when I am grilling. It makes the chicken, pork, or beef, so juicy when it is cooked. The longer you let the chicken in this recipe, sit in the marinade, the more flavor it will have. Even if you can only let it sit in the marinade for an hour, you will be surprised at what it does for it. Tuesday's Tips & Tricks post about lemons! Grilled Jalapeno peppers and onions. I have been traveling a lot this year. My most recent trip was to Chihuahua, Mexico. 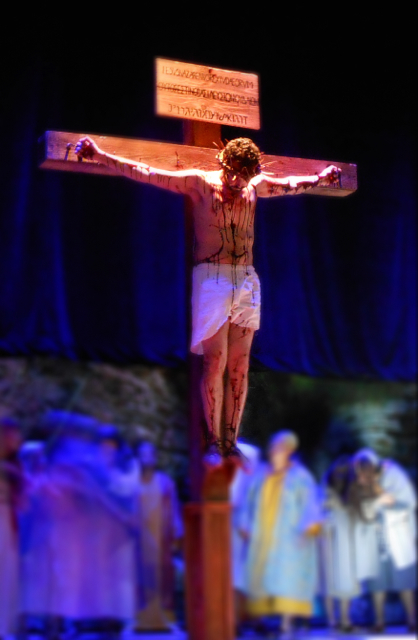 I am Executive Producer for, Passion Play Ministries International, and went as part of the Support Team. Our hungry PPMI Support Team. We work with the local churches in the city, to present a drama called, "He's Alive". I love to travel, but when you travel to a country and you don't speak their language, it can be challenging. 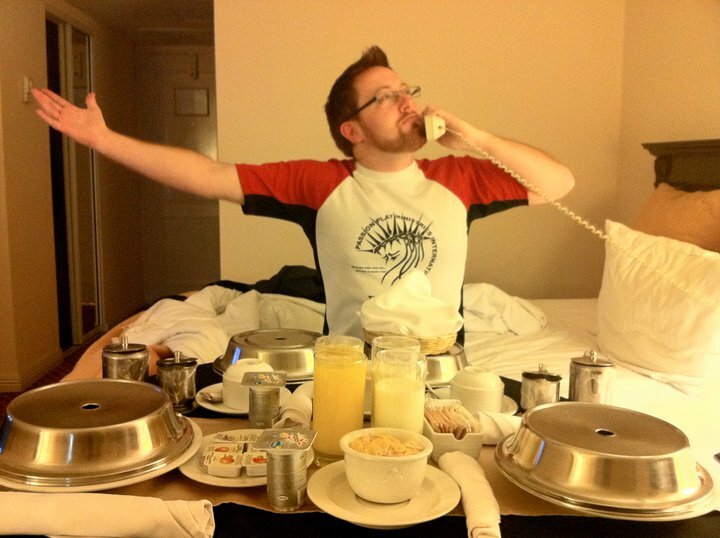 When we traveled to Honduras a year or so ago, my son tried to order two breakfasts, and ended up with four. On this trip to Mexico, my husband ordered us some quesadillas. He ordered off the menu, by telling them the number of the item. He ordered, one number one, and one number five. Instead, we ended up with five number one's. The language barrier is always good for a few laughs! One of the new foods I tried this time, was a drink called, Altole. It is served hot; flavored with cinnamon, and is very sweet. It has the consistency of runny Cream of Wheat or Malt-O-Meal. That may not sound appealing, but it was really good! or a plate full of sliced grilled onion, it doesn't matter, they love them! The proper way to eat the onion, is with salt and a squeeze of fresh lime juice. A strange but delicious meal I had, was at a taco restaurant. It is not your Taco Bell type of taco. You get a plate of meat and tortillas. In my case it was tender grilled marinated chopped steak and bacon, with grilled pineapple, melted cheese, and topped with a slice of bologna, served with mini tortillas. You assemble your own mini tacos. After all the bacon, cheese, and bologna, the next night I decided to order a healthier choice. I was delighted to see that you could have a baked potato instead of the typical French fries that seem to come with every dinner or lunch order. When the potato arrived, it was anything but healthier. Paula Deen would think she had died and gone to heaven if she saw this baked potato. It was a medium potato half, sprinkled with cheese and topped with half a stick of butter. I hate to admit it, but it was really good! I want to say a big, "Thank You", to everyone who followed my adventure on Facebook, and left a comment or gave me the thumbs up! It added an extra special element to my trip! 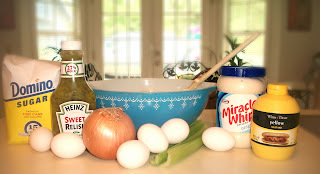 Today's recipe is not the typical recipe you see on my blog. I don't drink alcohol and if you don't either, you could exchange the wine and brandy for non-alcoholic substitutes, making it a family friendly recipe, that would be a fantastic drink for summer entertaining. I am doing a cookbook swap with another blog. 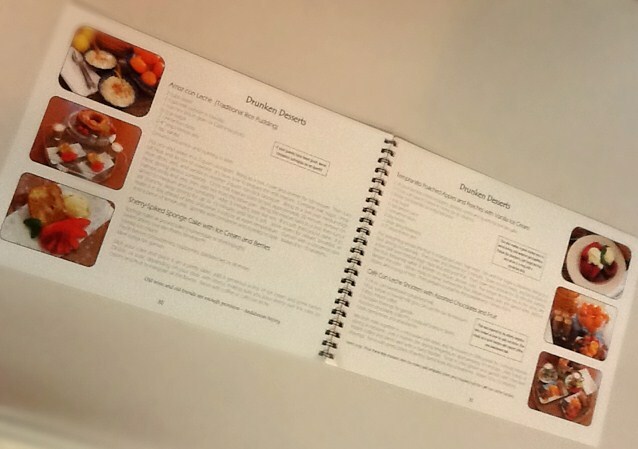 I am giving away and promoting their cookbook and they will be doing the same with mine. The sangria recipe comes from a cookbook I will be giving away called, "The Drinking Girls' Guide to...Spanish Food". 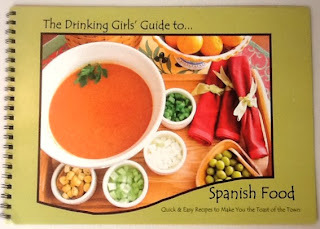 Army wife's and authors, Ashleigh Wehmeyer and Tiffani Warner, of The Drinking Girls blog, filled the cookbook with quick and easy recipes to make you the toast of the town. It has everything from appetizers to main dishes and desserts. It is also filled with beautiful pictures, wonderful stories, and helpful tips, making it a cookbook you have trouble putting down. the brandy and sugar mix. Let it sit overnight in the fridge, or if you just can’t wait, chill at least 3 hours. When ready to serve, add chilled wine and lemon-lime soda. Garnish with fruit. Makes 8 glasses. Ashleigh says: Unlike most sangria's, our does not include citrus, which we think has a tendency to leave the sangria bitter. Ours is extremely smooth and refreshing on a hot day. Also, we don't soak the fruit in the wine, we soak it in the sugar and Brandy. Part of what makes it so refreshing is a bit of bubbly lemon-lime soda. There is just something about bubbles! Tiffani also worked up a version where she used Splenda Baking Sugar in place of regular sugar for those who are looking to cut some calories. Just replace the one cup of sugar here with a half of a cup of the Splenda. Cutting calories without sacrificing the taste. The Girls, are trying to reach 100 followers on their blog. To help reach that number, they are giving away Drunken Jams, from their friends at Canning Italy. Stop by their blog and take at not only the jam but their delicious recipes! 2. Leave a comment on this post telling me you follow my blog. 3. For an extra entry, follow, The Drinking Girls blog, and leave a message telling me you follow both my blog and The Drinking Girls blog. A winner will be drawn on May 1st. Good Luck! to see pictures from my trip to Mexico. A couple of months ago, I got an email asking for a tip on how to peel garlic. I wrote two posts on the subject, Peeling Garlic and Peeling Garlic II. When I was at my Mom's last week, she gave me a another tip to pass along to you. Put the cloves of garlic you want peeled on a microwave safe plate. The garlic heats up and expands, causing the peel to crack. The clove easily slips out of the peeling! Thanks Mom, for yet another great tip! Line a 13x9 inch baking pan with aluminum foil. Spray with non-stick cooking spray. Press the packages of cookie dough into the bottom of pan. Sprinkle crushed cookies over top. Spread over top of cookies. Greetings from Chihuahua City , Mexico! I am here as part of a Passion Play Ministries International support team. We are here to help the Passion Play of Chihuahua, perform the play for the first time. You can follow my trip, on my Facebook page. This recipe was given to me by my friend, Darellyn. 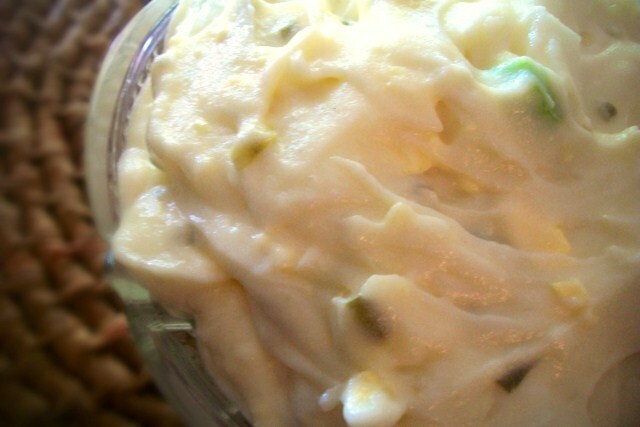 The original recipe had a long list of ingredients, and she cut it down to this simple recipe. It is rich and gooey! Very deserving of it's name. It would be great paired with a scoop of vanilla ice cream! 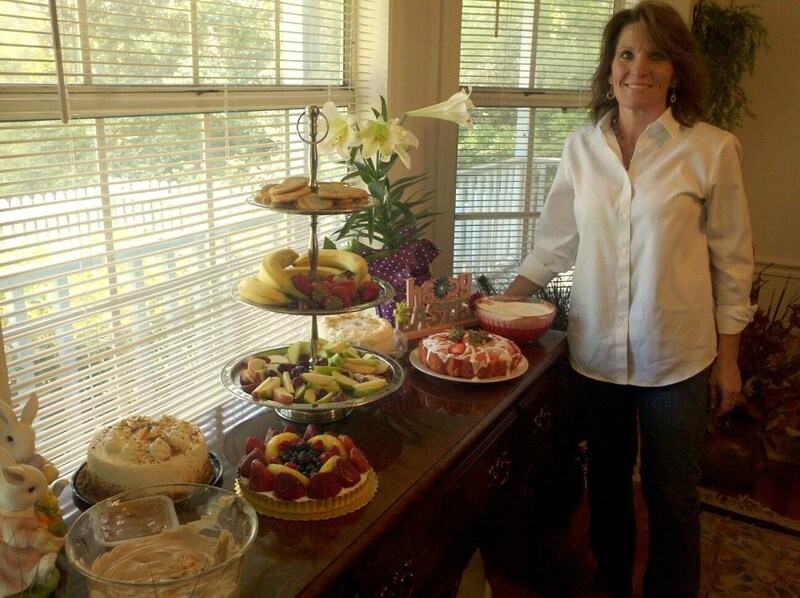 My sister Shelley, was in charge of the dessert table at our Easter dinner. You are never too old to learn something new from your mom! I spent Easter with my family in Florida this year. The day before Easter, my mom prepared some recipes ahead of time, set the dinning room table, and pulled out all the serving dishes she was planning on using for the dinner. It doesn't matter how many dishes you have, it seems you always need at least one more. My mom was peeling the price tags off of the new dishes she had purchased, when she came to one that was really stuck. She went to the bathroom and grabbed the blow dryer. After a couple of seconds of blow drying the sticker, it peeled right off. I decided to put this method to a test at my own home. I had a sticker that was really stuck to a soup mug and I couldn't get it off. 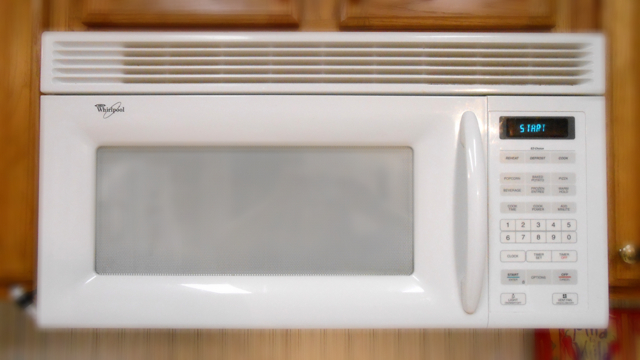 I even ran it in the dishwasher, and it still would not come off. I put my blow dryer on the high heat, and let it sit on the sticker for less than one minute. And low and behold, it peeled right off! Thanks Mom, for another great tip! Prepare fresh or instant potatoes to a thick and stiff consistency. 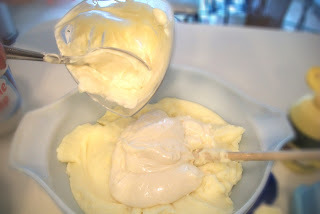 Cool mashed potatoes. with mustard, sugar, salt, and pepper. Add mixture to potatoes. Mix well. Add remaining ingredients. Mix well. 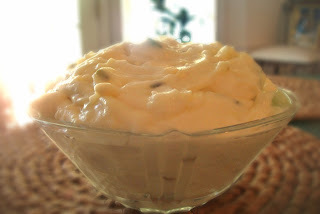 I am amazed at how many different types of potato salad there are. And some people are very vocal about what is and isn't potato salad. I am not picky; I enjoy all the different versions that are out there. My Mom, makes several different types of potato salad. This recipe is one of my favorites. 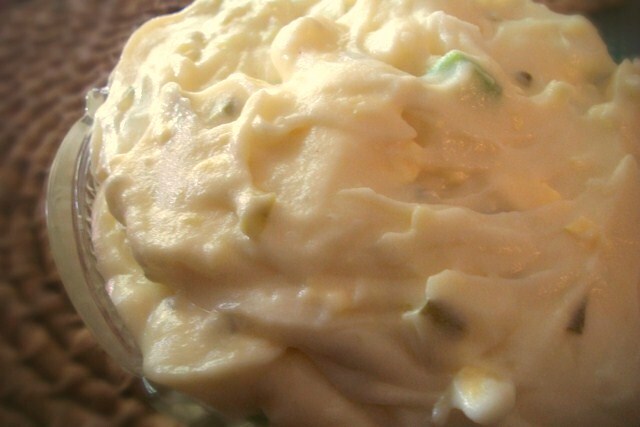 The potatoes are creamy but firm, and all of my favorite potato salad ingredients are mixed in. It is a perfect dish to make when you have leftover potatoes. You can cut down the ingredients to fit the portion size of the leftover potatoes, and customize the flavors to your personal taste.